Customize your pen functions by assigning settings to pen buttons, adjusting the pen tip feel and pressure, and selecting how you perform a right-click. Note: Some pens do not have buttons or an eraser. If there is a Tool row, select your pen. For each of the pen buttons, select the setting you want from the drop-down menu next to the pen. For the pen tip, double-click the pen tip in the image to display a drop-down menu. Then, select a setting for the pen to perform when you tap the tablet surface with it. Warning: The tip must be set to Click in order to draw for most graphics applications. The above screenshot is for descriptive purposes; it may not match your screen. Tip Double Click Distance: To change the distance between your pen and the tablet surface during a double-click, move the slider. Current Pressure: To see how hard you need to press with the pen, check your Current Pressure by pressing down with the pen tip or eraser in an empty area of the Wacom Tablet Properties window. If you want to change the amount of pressure you need to use the pen tip or eraser, move the Tip Feel and Eraser Feel sliders. Options: To select the way you right-click with the pen, click Options and select a different Pen Button Mode. Tilt Sensitivity: To change how much the tilt of your hand affects your pen strokes, drag the slider. Open an application that supports tilt to test while you are adjusting, so you can see how your changes affect your strokes. 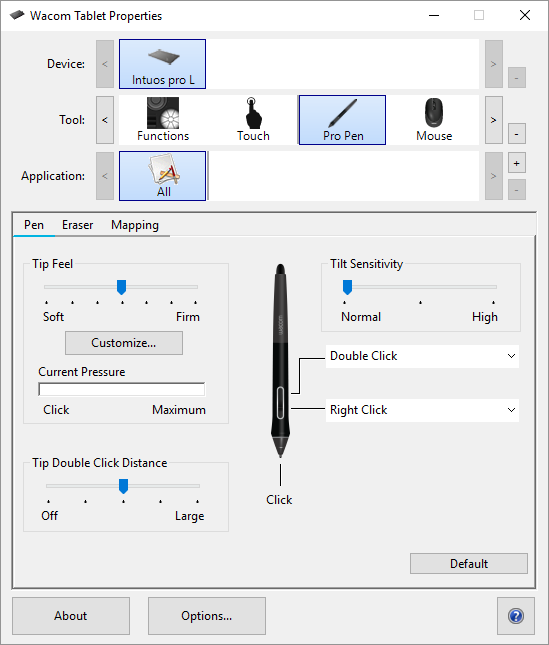 Pen Feel Details: To change the tip sensitivity, click Customize and adjust advanced pen and eraser options. Set the pen tip to Click and one of the pen buttons to Double-Click. If you want a narrower range of pressure values in a pressure-sensitive application, select a soft Tip Feel. If the pen overreacts to slight pressure, try a firmer Tip Feel setting. If you notice a delay at the beginning of brush strokes, inking strokes, or drag actions, try a smaller Tip Double Click Distance or set a pen button to double-click instead of the pen tip. You can return the pen to default settings by going to the Pen tab in Wacom Tablet Properties and clicking Default.